The Chameleon also comes pre-loaded with theMicrochip bootloader, thus you can use the protocol compatible tools to program the Chameleon over the USB port without a Pickit2 compatible ISP (in system prgrammer). However, we recommend that you purchase a Pickit2 ISP programmer (or similar), so you can use MPLab to its fullest potential, debug, as well as re-burn the FLASH bootloader if you wish to do so (or if its damaged accidentally). Microchip PIC24HJ128GP502 16-bit processor with 128K FLASH / 8K SRAM running at 40 MIPS (pre-loaded with Microchip bootloader). Parallax Propeller Multicore 32-bit processor with 8 cores running at 20 MIPS per core for 160 MIPS of processing power! Mini USB port with USB to serial UART (FTDI chip), used for programming the Propeller, PIC in bootloader mode as well as serial comms. I/O headers exporting digital, analog input inputs and power (95% compatibility with Arduino I/O headers). NOTE: If you want to use MPLab to program and debug the Chameleon you must purchase a Microchip Pickit2 or similar ISP programmer. However, the Chameleon is pre-loaded with the Microchip bootloader, so with only a PC and a USB port you can program the Chameleon out of the box! Chameleon PIC User Manual Ver 1 (.pdf). Hello World Example Source Code (.txt). The Chameleon™ PIC 16-Bit is the evolution of the high performance, small footprint, application development board. Similar to the BASIC Stamp™ and Arduino™ in concept, the Chameleon PIC takes these products to the next level with a huge leap in computational performance as well as I/O interfaces. Simply put, the Chameleon is a credit card sized computer with (2) processors, (9)processing cores, 1 MByte of on board FLASH, 64K of EEPROM, and over 200 MIPS of processing power! 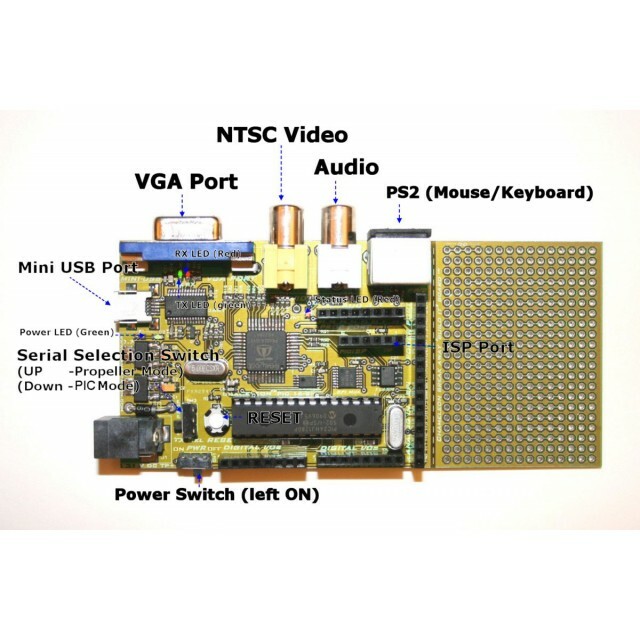 If that wasn't enough, the numerous I/O interfaces include composite video for NTSC/PAL generation, VGA, audio out, PS/2 for keyboards and mice. Additionally, the Chameleon has a number of digital I/Os and Analog inputs making the Chameleon perfect for industrial controllers, experimentation, education, wearable computing, or hobbyist use. The real power of the Chameleon is based on its dual processor design. The Chameleon PIC uses the Microchip PIC24 16-bit as the main master processor (client) and Parallax multicore Propeller chip as the media processor (server). Thus, instead of taxing a single processor system to do everything, the Chameleon offloads all the heavy lifting to the multicore Propeller chip which has 8 processing cores to perform tasks such as generate video, audio, read keyboards and mice, etc. The PIC simply sends commands to the Propeller chip over a high speed SPI interface to command the Propeller to execute various operations all with a simple API that usually consists of a few lines of code to perform any task. Thus, the PIC programming is very simple and with simple APIs, you can develop very complex and rich media applications that leverage the incredibly powerful Propeller chip's media rendering abilities and huge software library. For example, you can generate TV signals, VGA, read keyboards and mice with a few lines of code. The Chameleon is both a complete Microchip PIC24 16-bit application development board as well as Propeller development board. Both processors can be independently programmed and used. Additionally, the PIC and Propeller both have their own digital I/Os, so you theoretically you can run two applications on the Chameleon and use it that way or use the processors together over the SPI link. Also, the PIC system is 95% I/O compatible with the Arduino (headers are simply in different mechanical locations), so you can port Arduino software to the Chameleon PIC with a HUGE boost in performance! Moreover, the Propeller sub-system is compatible with most Propeller development boards and the HYDRA system, so the Chameleon will run most of those applications very little or no modification. Thus, the Chameleon is true to its name and truly is a "many in one" application system. We have written a complete BASIC programming language for the Chameleon, so you can code on the PC with a simple editor, compile and download to the Chameleon. Thus, you can choose from C/C++,Assembly Language or BASIC to program the Chameleon in. The BASIC is a work in progress with source code available, so you can use the source to write your own variants or complete new languages as well. Last, but not least the Chameleon has a "break away" experimentation protoboard built into the PCB. You can solder directly onto it, or place the mini solderless breadboard that comes with the Chameleon onto the area with 2-sided tape. If you don't want the experimenter board, you simply "break" it away and snap it off. Chameleon PIC 16-Bit system (pre-loaded with Microchip bootloader, so you can program using the USB serial port and included tools). Mini solderless breadboard 1.25 x 2" (affixes to right hand side of Chameleon). 150+ page electronic manual covering hardware, software, and numerous programming tutorials. DVD-ROM including all tools, and numerous examples with complete driver library lncluding; Graphics, Sound, Keyboard, Mouse, Serial Comms, and lots more. "Design Your Own Video Game Console", LaMothe. "Tricks of the Windows Game Programming Gurus", LaMothe. "The Black Art of 3D Game Programming", LaMothe. "How to Design and Build Your Own Custom TV Games", Heisermam. NOTES: If you want to use MPLab to program and debug the Chameleon you must purchase a Microchip PicKit2 or similar ISP programmer. However, the Chameleon is pre-loaded with the Microchip bootloader, so with only a PC and a USB port you can program the Chameleon.